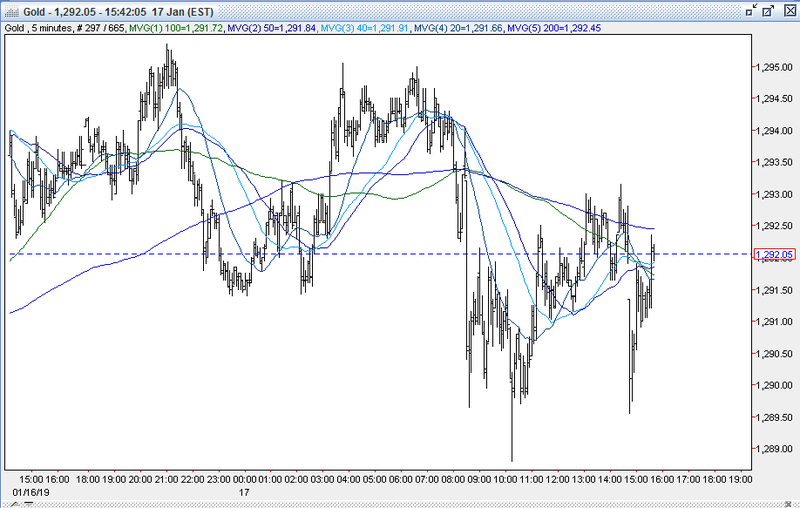 Gold edged lower last night, trading in a narrow range of $1291.25 - $1295.35. It traded up to its $1295.35 high early during Asian hours, where it again found resistance at $1295-98 (7 tops – 1/3, 1/4, 1/10, 1/11, 1/14, 1/15, and 1/16 highs). The move was fueled by some weakness in the US dollar (DX from 96.13 – 96.03), and a retreat in global equities. The NIKKEI fell 0.2%, the SCI shed 0.4%, European shares were off from 0.4% to 0.7%, and S&P futures were -0.3%. Equities were tugged lower from weakness in oil, as WTI slipped from $52.40 - $51.02 (US production at record 11.9M bpd). The yellow metal traded down to its $1291.25 low during later Asian hours and into early European time, where support at the up trendline uptrend line from 12/14 $1233 low held. This was as the DX recovered to 96.25 - supported by a pullback in the pound ($1.2890 - $1.2833), and the euro ($1.1401 - $1.1372) on refreshed Brexit uncertainty. However, gold bounced back to $1295 ahead of the NY open, as a miss in earnings from Morgan Stanley softened US equity futures, and helped tug the DX back to 96. At 8:30 AM, stronger than expected readings on US Jobless Claims (213k vs. exp. 220k) and the Philly Fed Index (17 vs. exp. 9.5) helped lift S&P futures and took the US 10-year bond yield up from 2.707% to 2.738%. The DX bounced back to 96.17, and gold briefly broke through its up trendline support at $1291 to reach to $1290.25. 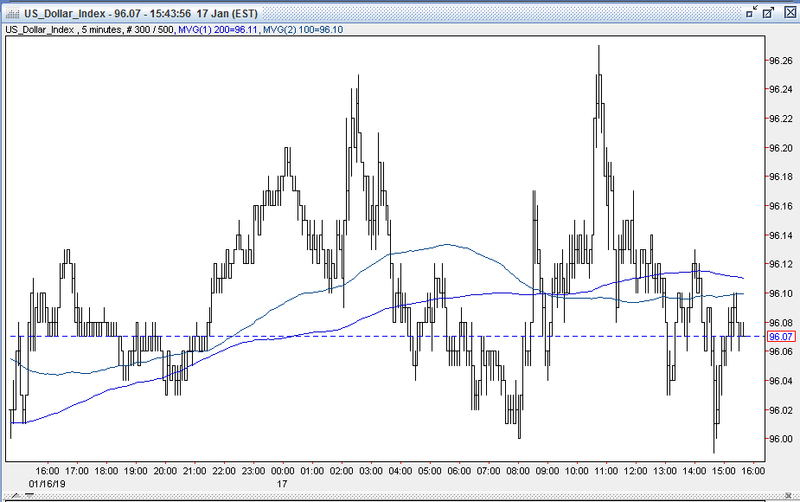 US stocks opened weaker (S&P -11 to2605), and the DX slipped back to 96.04. This, along with some aggressive dip buying helped gold recover to the $1291-92 level. However, later in the morning, US stocks turned higher (S&P +7 to 2623), with strength in the Materials and Industrials sectors leading the gainers. The 10-year yield remained steady around 2.735%, and the DX popped up to 96.27. Gold declined to $1288.80, where solid support from the last 6 sessions between $1286-88 held once again. Into the afternoon, US stocks continued to climb (S&P +11 to 2626), and the 10-year yield remained around 2.735%. The DX failed to advance, however, and was tugged down to 96.03 from strength in sterling ($1.2991) and the euro ($1.1394) on news that meetings between UK Conservative and Labor lawmakers have been constructive, and comments from EU negotiator Barnier that the EU is open to the possibility of an agreement with Britain that goes beyond free trade. Gold rose in response, trading up to $1293. Later in the afternoon, a report from DJ that the US was weighing the lifting of China trade tariffs to hasten a trade deal sent US stocks soaring (S&P +40 to 2645). The 10-year yield popped to 2.758% (1-week high), while the DX dropped to 95.99. Gold was caught in the crosscurrents but fell to $1289.50. However, shortly afterward, a Treasury Dept spokesman quickly remarked that neither Mnuchin or Lighthizer have made any recommendations with respect to tariffs or other parts of the negotiation with China. US stocks pulled back, with the S&P retreating to 2636 (+20), while the 10-year yield was steady around 2.75%. The DX improved to 96.05, and gold clawed back to $1292. Open interest was off 0.3k contracts, reflecting a small net of short covering from yesterday’s advance. Volume was lower with 211k contracts trading. Bulls remain disappointed that gold keeps failing at the $1295-98 resistance area – especially when the DX dipped to the 96 level and on the early pullback in equities. 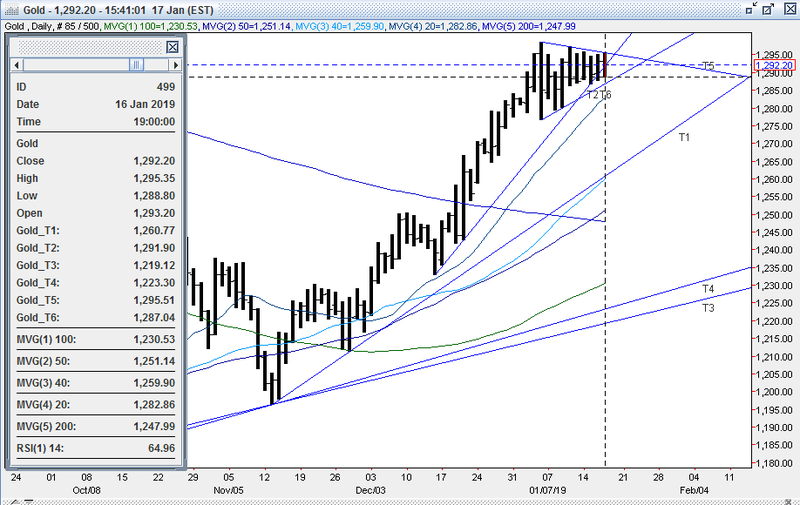 However, other bulls were pleased with gold’s ability to still hold support in the high $1280’s – despite a recovery in the dollar, a rebound in the US 10-year bond yield to 2.75%, and with yet another strong gain in US stocks today. Bulls feel that the trend is their friend, and expect the yellow metal’s strong rally over the past two months to carry further. While we haven’t seen the COT report in 4 weeks, bulls maintain that despite gold’s sharp rally, a significant amount of large fund shorts still remain, and will provide further upside momentum when forced to cover. Bulls expect to breach tough initial resistance at $1295-98 (8 tops –1/3, 1/4, 1/10, 1/11, 1/14, 1/15, 1/16, and 1/17 highs), where they expect to trip some significant short covering that they feel should open up a test of next resistance levels at $1303 (6/15/18 high), $1309 (6/14/18 high), and $1315 (5/15 high). 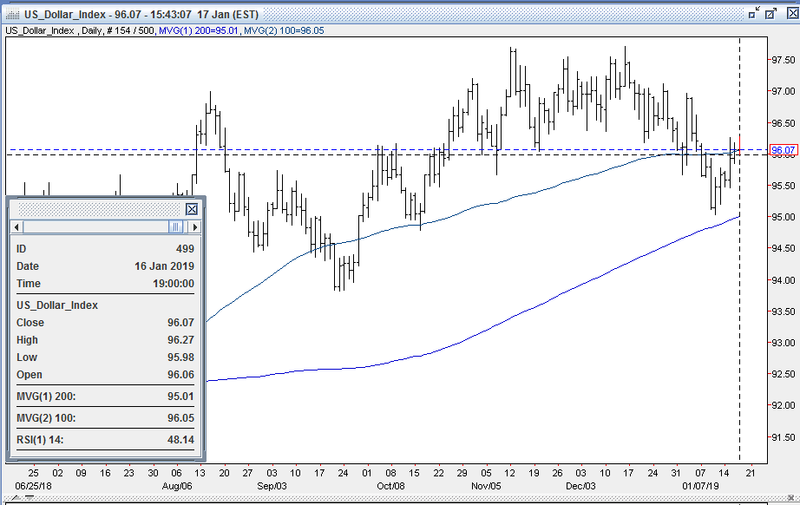 Bears feel that the plunge in the US dollar seen since 12/14 (97.71 – 95.03, 2.74%) has also overshot, and look for a significant rebound in the greenback. Bears will look for a breach of support at $1286-88 (6 bottoms – 1/10, 1/11, 1/14, 1/15, 1/16, and 1/17 lows) followed by the double bottom at $1279-80 (1/8 and 1/9 lows) to begin a more significant correction. All markets will continue to focus on geopolitical events (especially Brexit developments), developments with the Trump Administration (especially on US-China trade, potential legal issues), oil prices, Q4 corporate earnings, and will turn to reports tomorrow on Japan’s CPI and Industrial Production, UK Retail Sales, US Industrial Production, Capacity Utilization, University of Michigan Sentiment, Baker-Hughes Rig Count, and comments from the Fed’s Williams and Harker for near term guidance. However, the release of many US reports are subject to the ongoing government shutdown.